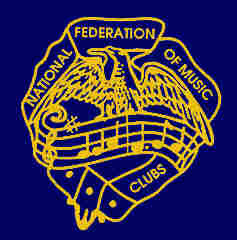 The Nebraska Federation of Music Clubs offers performance opportunities, scholarships, grants, auditions and competitions. Junior Festival is the National Federation of Music Clubs' annual performance event for students of all levels. It is not a competition, but rather an opportunity for the students to perform two memorized pieces of music for an adjudicator and an audience. The student's performance is judged individually and is not compared to the performance of other students. By participating in Junior Festival each year students earn points towards receiving a National Gold Cup, or trophy. Each successive Gold Cup is a little bigger than the previous one. It takes a minimum of three years to earn each Gold Cup. Junior Festival performance covers all instrument families, solos, ensembles, and vocal performance. It also includes Hymn Playing and Theory. In Nebraska, students who receive four or more consecutive Superior ratings in one Festival may participate in the Nebraska Federation of Music Clubs Junior Division State Honors Recital. Look at these hard working students! 2018 was another great year at Jr. Music Festival! Congratulations to all our Festival participants! Congratulations to our Jr. Music Festival participants! Classical Improvisation, Excellent- Marilla Flynn, Morgan Boroviak, Joel Poppe. Hymn Playing, Superior – Kaylee Hostler, Shelby McHargue, Sidney McHargue. Hymn Playing, Excellent – Marilla Flynn. Hymn Playing, Satisfactory – Joel Poppe. Piano Duet, Superior – Marilla Flynn and Morgan Boroviak, Kaylee Hostler and McKenna Leonard. Piano Solo, Superior – Marilla Flynn, Joel Poppe, Kaylee Hostler, McKenna Leonard, Shelby McHargue, Sidney McHargue, Grant Lindner. Sight Reading, Superior – Marilla Flynn, Anna Garrett. Sight Reading, Excellent – Morgan Boroviak, Joel Poppe. Theory Exam, Superior – McKenna Leonard, Kaylee Hostler, Joel Poppe, Marilla Flynn, Morgan Boroviak, Grant Lindner, Sidney McHargue. Theory Exam, Excellent – Anna Garrett, Shelby McHargue. Vocal Solo, Art Song, Superior – Anna Garrett. Vocal Solo, Art Song, Excellent – Kaylee Hostler. Vocal Solo, Musical Theater, Superior – Anna Garrett, Morgan Boroviak.